A mother is a person who loves and cares for you. 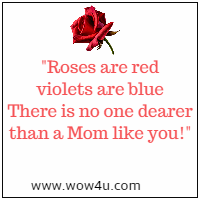 Let these Mother quotes be ones that you share with your Mom and find wishes for a Happy Mothers Day. 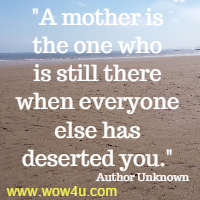 Mom's are special people in our lives. Mother... a mother holds her child's hand for just a short time, but holds their hearts forever. than a Mom like you! 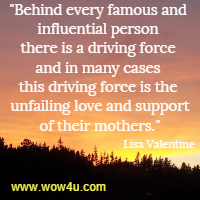 Mother was by far the greatest personal influence in our lives. 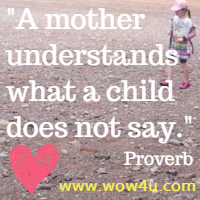 Being a mother has been the most challenging and the most rewarding position I will ever hold. Cathy Shaffer, Conversations With My Daughter: Love is patient. Love is kind. Words don't express how much of an amazing mother I think you are. Thank you for your love and support. Mom you gave me life and you filled it with love, encouragement and praise. You always believed in me even when I had doubts. I feel so blessed to have a Mom like you. Growing up I should have said sorry more often, there were times I regret but I never regret having you as a Mom. Thank you Mom and sorry for the times I should have said so! You deserve so much more than I could ever give. You are an awesome Mom. Love you forever. A friend for life that is what you are Mom. Words cannot convey how much our friendship means to me. Mom, if I could pick a flower every time I give thanks for you then all the flowers in the world would be picked. Even when you disciplined us we could always feel your love. Thank you Mom for being the exceptional woman that you are! No one could ever replace you. Your smile, your hug, your encouraging words. I appreciate all you have been to me. You are the best.